Hipotronics tank type series of resonant test systems are specially designed for testing power cables, power factor correction capacitors, generators and more. Allowing for multiple taps the TSR systems can provide the needed voltage and current for a wide range of applications. 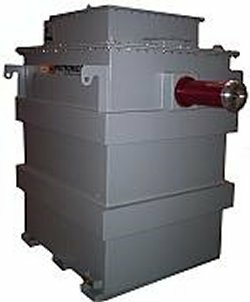 Just like the MSR Series, the TANK type systems provide undistorted high voltage at power frequency for testing high KVAR capacitance loads. It does so at a lower cost and with substantially lower single phase input power compared to conventional test transformers. In addition to its superior technical performance, this technique saves cost due to the reduced input kVA required by a customer and lower installation cost for power service because the load is at unit power factor. Voltages can range from 15kV to 400kV and system power ratings up to 36,000kVA. Pure AC sine wave at output. Series or Parallel Resonant Operation. Mobile via forklift, crane, or air pads. PD free (down to 2pC, with necessary measures). No transient over voltages generated during flashover. PC based controls hardened for industrial and laboratory applications (with remote assistance). Series Resonance provides a protective voltage collapse should the device under test fails. Multiple Q values to meet a variety of applications. Lower installation cost for power service. Expandable for future testing needs.